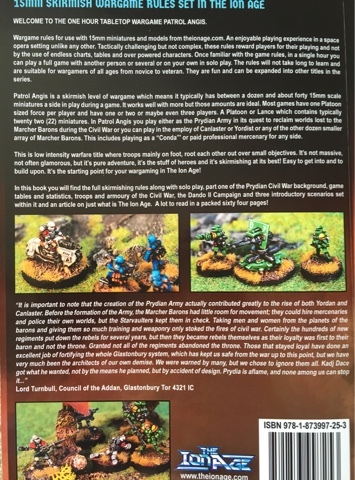 Recently I have been scouring the web for information on Patrol Angis, the new set of rules from Gavin and co at The Ion Age. I was intrigued by the description of the rules and the setting but could not find a great deal more than what was on the website. So naturally I thought 'what the heck, they are only £10' and bought a copy! To make up for the lack of information available, I thought I'd give my initial thoughts here. The book itself is a very well presented A5 size publication with full colour cover and black and white images inside. It has seriously started to make me wonder why more rules are not this size! It means they can easily be rested on the table during a game for quick reference and it also makes them easy to handle or hold in one hand while the other one is rolling dice or holding a refreshing beverage. Good thinking, chaps! The first 20 or so pages of the book deal with the background to the setting, which could be described in a nutshell as being the Wars of the Roses in a Space Opera setting. 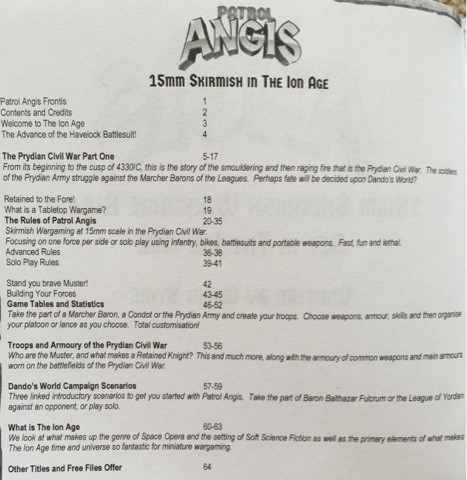 While the rules could be used with other miniatures, the setting and content of the book is obviously geared to the Ion Age range. 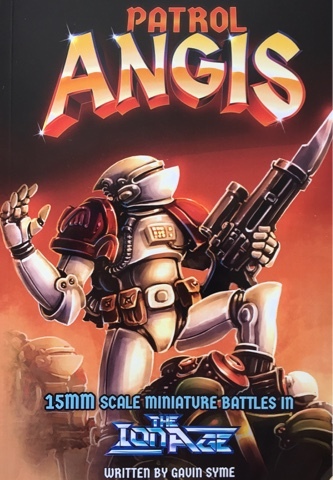 What is different about this book is that, while my usual inclination is to discard the fluff and just play with my existing figures, reading this particular background has really got me wanting to play the rules with the Ion Age figures and in the Ion Age setting. I really wasn't expecting to feel that strongly, but the background in the book is highly interesting and different to other things I have read. The rules say they are aimed at each player having a platoon sized force. This immediately made me think of three squads plus a command group on each side, but I was wrong! While this gives an idea of the number of figures you might expect to field, you actually have quite a lot of flexibility in how your force is organised. You can choose to deploy in squads, sure, but you can decide to split your squads into fire teams or even smaller units if you wish. So there is actually a good amount of decision making in terms of how you wish to deploy your platoon and you would want to think a bit about how you might use your options to achieve your objectives. It should be noted that this book contains rules for infantry, power armour and infantry-sized vehicles, such as bikes. Larger vehicles and how they fit into the force structure will be covered in a future book. Unusually for a game of this type, the core mechanic is an intriguing command and control mechanism. Initiative is a d6 roll, but the higher roll determines how many activation tokens are received by each side. The side which loses initiative gets the number shown on the die, the winning side gets that number plus one. So if the initiative roll was 3 and 5, the side which won gets 6 tokens and the side which lost gets 5. A good way to give a little edge to the winner without being overpowering. Starting with the side that lost initiative, players then take it in turns to place an activation token next to an element in their force. Unless specified, an element can be assigned any number of tokens during this process. This is an interesting mechanic which leads to you trying to out guess and out plan your opponent before you have even touched a miniature! During the main part of the turn, starting with the side with initiative, the player removes an activation token from an element and chooses what that element will do. There are no less than 11 (well, 10 and the option to pass!) choices to select from and these cover moving and firing, rapid moving, precise firing, overwatch, reorganisation, recovering morale, digging in for self protection and lots more. To add to this, elements which are fired upon can also use activation tokens to negate hits against them, so you may have to make a tough choice about taking casualties or keeping your head down for a turn, which in effect is a neat little pinning mechanic! Now let's be clear, fire combat in this game can be pretty deadly! All rolls to hit are made with a d8 and have a basic target of 2+. That's right, there is only a 1 in 8 chance of missing a target in the open! Of course, terrain modifiers come into play and each item of terrain provides a bonus from +1 to +3 depending on how much of the LOS crosses it. If there is terrain along more than 10cm of the LOS then no fire is possible. The max terrain modifier is +4. So terrain starts to be rather important in this game! Any hit figures can make an armour save roll, which is a 4+ modified by the armour worn and the penetration of the weapon. Taking casualties results in the need to make morale tests. Failing a test results in the loss of an activation token if the element has one, or the gain of a 're-motivation' token if they do not. The re-motivation token has to be removed with an activation before any other action can be taken. Lets not forget that you only get between 1 and 7 activation markers each turn (skewed toward the high end as the winning roll determines the number). 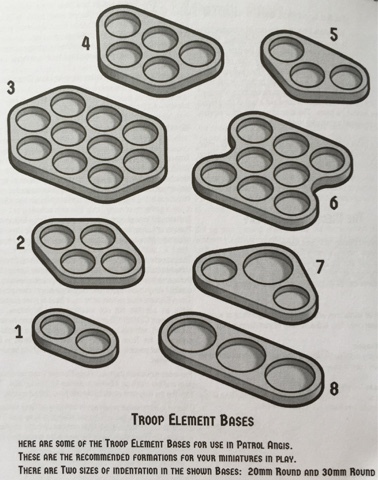 So if your force consists of smaller elements then you have some tough choices to make when allocating them. And it gets even harder when morale checks force you to remove them or waste one next turn to re-motivate an element. After the main rules section, there are a couple of pages outlining a series of special rules which may apply to units, covering things like jet packs, medics, snipers and special gear. There is also a section on solo play, which will be largely familiar to players of Flintloque. 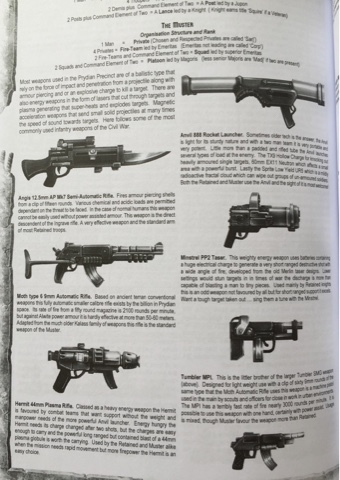 Then there are 10 pages of stats for the various forces available and some 'fluff' on the types of weapons and armour available. The book ends with some brief designer's notes and some additional background which outline the 'rules' of the setting in terms of why certain technology exists and why the universe works the way it does. I have to say I wasn't sure what to expect from this book. I was expecting something solid, fun and playable. What I found when I read the rules was all of those but arranged around a command and control system that I have not come across before in a sci-fi rule set and some nicely brutal combat rules that punish commanders who think acceptable battle strategy is advancing across open ground. I also found myself really getting drawn into the background and enjoying it, it manages to feel 'fun' but also have a nice amount of detail to it. My only slight criticism at this point would be that I found some of the rules sections to be a little unclear. My questions were answered by the examples, however, so there were no problems left after I had read them, although I prefer examples to be optional rather than required reading. But that is a minor point in an otherwise excellent looking set of rules. There is a lot crammed into the 64 page book and the rules themselves do not take up a massive amount of it (about 17 pages for the core rules). But at the same time I am left with the feeling that they present a lot of tactical challenges in a deceptively simple package. I have often described rules by this designer as being quite 'old-school'. In this case I don't think that is true at all. I think these are a modern set of rules which will let players fight 'old-school' type battles they way they remember them being rather than the way they actually were (i.e bogged down in loads of die rolls and endless charts and tables!). I would highly recommend these rules to anyone who is either drawn to the accompanying miniatures range or interested in a more tactically challenging sci-fi game which is still simple to play. As always, your game system review's are informative & presented in an easy to read format. The activation token idea sounds interesting. Might be a simpler way of "giving order's to your troops" rather than writing secret order's on a piece of paper & then revealing them to your opponent? Thanks for your comment! I'm pleased you enjoyed reading the review. You are right about the activation token system. It lets you decide which of your elements are going to be most active without tying them down to particular actions, so there is still the opportunity to respond to what the enemy is doing. You're welcome. I'm pleased you enjoyed it and that it might help your decision making! Great review! Just received the starter today and this was a nice primer to get my brain waves flowing to get working on it. Nicely done! Hi! Thanks very much, I'm pleased you found it both interesting and useful. I've got a few more blog posts specifically around the starter set in the pipeline, so keep an eye out for them! You should get a finder's fee! I was not at all interested in these rules...until I read this (and the battle report from the link posted on Dropship Horizon). Now - they seem like a best buy. I really like the way that AOE weapons are handled. I do wish they had rules for vehicles, though - 15mm makes it economical to have vehicles and leaving them out seems like a bad decision. Hi Nicholas. Thanks for taking the time to comment, I am pleased you enjoyed the review and the batrep. Time is limited when you have a small baby, but I try and do what I can to give people something informative and fun to read! I am in no way opposed to systems with templates, but find that PA's method is effectively the same thing in the end result, with the added bonus that you don't fall into gamey habits about spacing figures to minimise the effect of heavy weapons. It's one of those things where I'm surprised it isn't more widely seen in rules! Cuts out quite a lot of faffing around if you ask me! The rules for vehicles are going to be published soon. The core rules covers battlesuits and bikes, but yes, bigger vehicles are on the way. "Do you want to know more?"